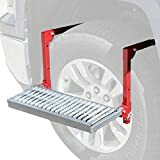 Premium Red Hound Auto Heavy Duty Full Size Truck Tire Service Step. Give yourself a great big step up with this premium heavy duty adjustable full size truck step. 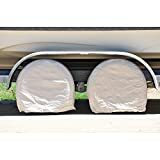 Designed to wrap over your vehicle's tire, this product creates a convenient, sturdy, no-slip step for maintenance, cleaning, loading and much more. Tough, heavy duty steel construction (coated for rust and weather protection). Fits all standard diameter tires (with up to 13" wide tread area), with easily adjustable tire depth and step height. Folds flat for storing when not in use. Product is backed by a no-hassle One Year Guarantee against defects. Features: Product is brand new in factory packaging (never used or opened). Great for service trucks, SUVs, semis and vehicles with roof racks. Included: One heavy duty folding adjustable tire step. Dimensions: 21" x 7.25" Step Area. Durable, secure "cheese grater" style non-slip step. Material: Tough, heavy duty steel construction (coated for rust and weather protection). Capacity: 300 lbs. Easy installation. Factory direct pricing without middleman mark-ups. In stock in the USA and ready to ship. One Year Guarantee against workmanship and defects. Heavy Duty Full Size Truck Tire Service Step. 21 in x 7.25 in Step Area. Great for service trucks, SUVs, semis and vehicles with roof racks. Durable, secure non-slip style step. Eliminate downtime with the Marathon Flat Free Hand Truck Tire and Wheel Assembly. It is the perfect replacement for most hand trucks, including popular brands like Harper, Magliner, Milwaukee, Roughneck, Sparco, Wesco and more. The tire is 10.5" in diameter and is also compatible with a variety of utility equipment such as pressure washers or generators. It is made of solid, polyurethane foam that has the same bounce and handling feel as an air-filled tire. It won't leave marks on any surfaces and will not deteriorate when left exposed to sun or moisture. Best of all, it’s guaranteed to never go flat. The Marathon brand features a full line of air filled and flat free tire and wheel assemblies for lawn and garden and commercial/industrial equipment. This includes universal fit and exact match options to accommodate nearly every application. Count on Marathon for quality, easy-to-install products at a great value. 4.10/3.50-4" (10.5" diameter) with a 2.25" offset hub and 5/8" ball bearings. This tire and wheel assembly is commonly used on hand trucks (dollies), generators, power washers and other utility equipment. Comes pre-mounted on a solid steel, silver wheel for quick and easy installation. Has the same feel and handling of an air-filled tire, but guaranteed to never go flat. Features a load capacity of 300 pounds and a sawtooth tread for the perfect balance of traction and maneuverability. 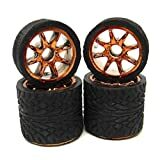 Tires, rims without adhesive, You can be split. The RWM Casters SN2 hand truck wheel has an 8" diameter and a 2" width, 5/8" axle hole diameter, 440 lb. capacity, tire made of solid rubber to resist punctures and does not go flat, and a hub made of white polypropylene for strength. 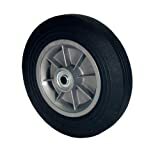 It is used as a replacement wheel for many hand trucks with 5/8" axles. The hub is off-set to provide greater clearance between the wheel and the hand truck compared to center-mount hubs. The wheel has a ball bearing to help reduce friction and support the load. RWM Casters manufactures casters, wheels, and material handling products for automotive assembly, aerospace, and industrial applications. The company, founded in 1988 and headquartered in Gastonia, NC, meets International Organization for Standardization (ISO) standard 9001. Our Premium TPMS with a 'Lifetime Warranty (Limited)'. This System features a larger, easier to read Monitor with LCD Screen. With an updated User Interface from our Basic TT-400 System, the TT-500 is much easier to program and simpler to use. The TT-500 will also measure pressures up to 232 psi and includes temperature monitoring as well. With the new 'Automatic Update Feature' the current pressures and temperatures will display on the screen with 10 minutes. The TT-500 will work with existing TT-400 sensors. Our TT-500 is the most innovative TPMS on the market today. We are TPMS Experts since 2004 and offer 7 day per week customer service plus we are the 1st and only company to offer a 'Lifetime Warranty (Limited)' on the TT-500. System Includes: Programmable Monitor/Receiver; 12-Volt Micro USB Power Cord; 4 Wireless Tire Pressure Sensors with Replaceable Batteries; 4 Sensor Batteries (CR1632); Sensor Locks; Pedestal Mounting Bracket; Anti-Seize Compound; Instruction and Operating Manual. PLEASE NOTE: An optional Signal Booster may be needed in certain configurations, i.e. Metal Skinned RV's, Diesel Pusher's, RV's longer than 36', Multiple Slide-Outs, etc. We cannot guarantee whether a Signal Booster will be needed or not. Please contact us at 866-200-9773 with any further questions. Eliminate downtime with the Marathon Flat Free, All Purpose Utility Tire and Wheel Assembly. The tire is 12.5" in diameter and is compatible with many types of utility equipment such as hand trucks (dollies), garden carts, tow-behind garden trailers, sprayers and more. It is made of solid, polyurethane foam that has the same bounce and handling feel as an air-filled tire. It won't leave marks on any surfaces and will not deteriorate when left exposed to sun or moisture. Best of all, it’s guaranteed to never go flat. Note: not for highway use. The Marathon brand features a full line of air filled and flat free tire and wheel assemblies for lawn and garden and commercial/industrial equipment. This includes universal fit and exact match options to accommodate nearly every application. Count on Marathon for quality, easy-to-install products at a great value. 4.10/3.50-6" (12.5" diameter) with a 2.25" centered hub and 5/8" ball bearings. This tire and wheel assembly is commonly used on hand trucks (dollies), sprayers, garden carts / tow behinds, and other utility equipment. Comes pre-mounted on a solid steel, white wheel for quick and easy installation. Features a load capacity of 350 pounds and a sawtooth tread for the perfect balance of traction and maneuverability. Eliminate downtime with the Marathon Universal Fit, Flat Free Hand Truck Tire and Wheel Assembly. 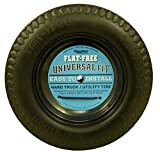 This tire is compatible with most hand trucks (dollies) including popular brands such as Harper, Milwaukee, Wesco, Magliner, Roughneck, Safco and Sparco. 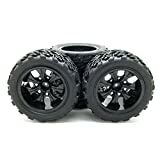 The tire is 10.5" in diameter and can also be used on many types of utility equipment such as air compressors, pressure washers, generators, blowers, garden carts, and more. It is made of solid, polyurethane foam that has the same bounce and handling feel as an air-filled tire. It won't leave marks on any surfaces and will not deteriorate when left exposed to sun or moisture. Best of all, it’s guaranteed to never go flat. Note: not for highway use. The Marathon brand features a full line of air filled and flat free tire and wheel assemblies for lawn and garden and commercial/industrial equipment. This includes universal fit and exact match options to accommodate nearly every application. Count on Marathon for quality, easy-to-install products at a great value. Fits most hand trucks and other utility equipment. Compatible with nearly every hub length and bearing size for tires measuring 10.5" in diameter (labeled as 4.10/3.50-4"). Features a load capacity of 250 pounds and a sawtooth tread for the perfect balance of traction and maneuverability. Comes with a 2.25" offset hub and bearings for a 5/8" axle pre-installed. Includes an adapter kit to fit hub lengths up to four inches and an axle size of 3/4". Adapter kit features: (1) 1/4" spacers, (3) 1/2" spacers, (2) 3/4" ball bearings, (1) 5/8" axle cap.